This product has a 5-inch 16-level grayscale display with a resolution of 480 x 480-pixels. It has a built-in temperature sensor, automatic and advanced mode, and the TrackBack option. However, it doesn’t have GPS. It’s easy to install and use. The quality is great considering the fact it’s pretty affordable. It also has adjustable LED lights. Mark-5x Pro comes with a powerful dual-frequency sonar optimized for other Lowrance technologies integrated. Although it doesn’t have a color screen, it pays off with other useful features. It’s compelling yet simple enough for use. 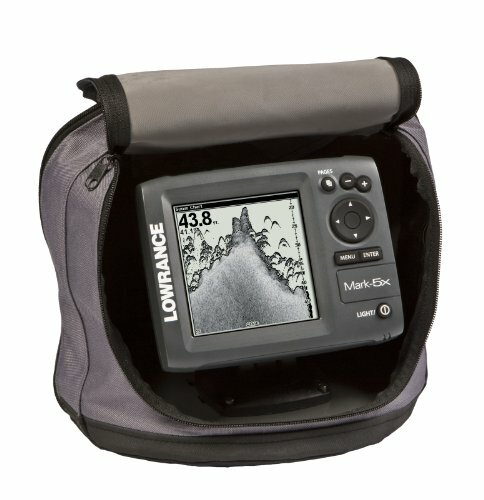 This fish finder is pretty straightforward and easy to install. It provides accurate readings and delivers an excellent visual presentation on display. Its 5-inch display offers enough room for a lot of terrain and structure underneath the vessel. Whether you’re a professional or an amateur angler, this device will come in handy. It’s quite durable and efficient at the same time. In this review, we will mention some technical parameters as well as overall quality of the product. Before you decide to buy a fish finder you need to consider your demands and expectations, as well as your budget. After you determine these elements, you’re ready for the next step. The 5 inches of the display surface offers more than enough room for precise readings. Although, it’s not an impressive size of a display, it’s relatively standard. The resolution, on the other hand, is quite remarkable. This resolution allows the user to see an excellent visual presentation of the situation below the boat. Many people praise color displays over black and white ones, but you can read the screen equally well without colors. In fact, color screens tend to boost up the overall price of the fish finder. This finder maintained its affordability by having a black and white display. The adjustable LED lights also add up to the usability of this finder. You can quickly fine-tune the backlight of the screen for the night as well as for day fishing. This device uses the company’s advanced technology to help you find fish and improve your fishing experience. There are a couple of things involved that are worth mentioning. The transducer comes with an in-built temperature sensor. This commodity allows you to have an insight on few important stuff. It reads the temperature, bottom structure, and terrain. These parameters can be useful if you’re, for example, tracking the migration of fish. In fact, by determining the temperature of the water, you can ascertain the type of fish you’re seeing. Automatic and Advanced mode offers both simplicity and complexity. These modes are what makes this fish finder different than others. It doesn’t matter if you’re a professional or an amateur, you’ll find your way around with this device. With the automatic mode, you can let the software optimize the performance. There are no complicated options; it’s all pretty straightforward. However, if you want to enter into an advanced mode, you can enable some other features this fish finder offers and synchronize them with conventional ones. In simple words, you can customize the features as you wish. The TrackBack option is a trademark of Lowrance, and it lets you read your fishing history. It comes in handy if you want to review some of your old logs and maybe catch a detail you might have missed the first time. Also, this feature isn’t standard in affordable fish finders, and that makes it even more valuable. The significant upside of this fish finder is the sonar technology along with the integrated technologies. It provides a fantastic visual representation of the situation underneath your boat. It’s also convenient and easy to use. The installation doesn’t take long, and anyone can do it. You don’t have to be an expert to install and start using this fish finder. The other thing is the durability. This fish finder doesn’t mind getting wet. It is well-made and withstands various rough weather situations typical for marine conditions. Another thing that separates Lowrance from others is the Lowrance Advantage Servic﻿e. They have a warranty program which allows you to repair the device relatively quickly. The warranty also covers unlikely events and sudden malfunctions. The biggest downside is the grayscale display. People tend to use the color screens nowadays, and many of them consider grayscale outdated. It’s not true, fish finders with grayscale displays work equally well as the color ones. Not having GPS can also be a burden sometimes. You won’t be able to mark individual waypoints or track your movement. However, there is a solution. Consider purchasing an additional GPS device and sync it with your fish finder. That said, this fish finder is an attractive option for potential buyers, considering it has an affordable price and some neat features. This product will make your fishing experience much better. Whether you’re just having fun or you’re entirely committed to fishing, this fish finder might be the right thing for you. Coming from Lowrance, you don’t have to worry about the quality of production or the hardware. They are well-known for making top-quality products within the low-budget range. The perfect combination of easy installment and excellent features should be enough to persuade an average angler to consider using this fish finder. It might not thrive in display performances and color, but it makes up with the technologies integrated into it and offers accurate readings and visual presentation.